#3 A battalion commander assigned to the 101st Airborne Division at Fort Campbell, Kentucky sent out a mass email to those under his command last year that included the “Christian Right”, the Family Research Council and Focus on the Family founder James Dobson under the heading of “Domestic Hate Groups”. #4 An unclassified guide for military leaders that was published in August 2011 identifies those that exhibit “extreme religious intolerance” as potentially violent radicals. If you claim that your faith is the only true faith (like most Bible-believing Christians do), that would put you into this category. #5 Earlier this year, the Pentagon issued a written statement to Fox News that stated that “religious proselytization is not permitted within the Department of Defense” and that “court martials and non-judicial punishments are decided on a case-by-case basis”. 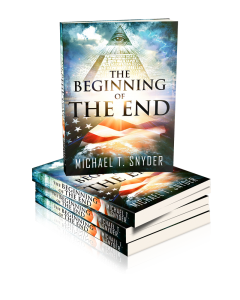 #6 One of the top consultants that Barack Obama has brought in to the Pentagon to work on issues related to religion in the military, Mikey Weinstein, has described evangelical Christians as “human monsters” and “enemies of the United States Constitution“. #7 Mikey Weinstein also teaches that when an evangelical Christian shares his or her faith, it is the equivalent of being “spiritually raped by fundamentalist Christian religious predators“. #8 In April of last year, a U.S. Army training presentation specifically identified evangelical Christians as religious extremists. 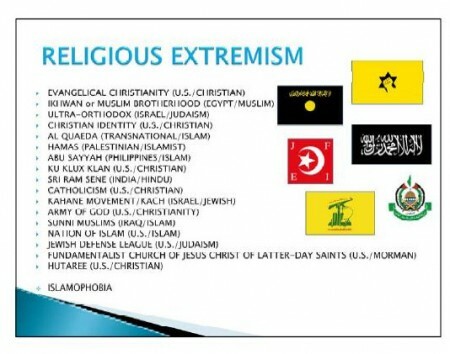 On a slide entitled “Religious Extremism”, “Evangelical Christianity” was at the very top of a list of extremist religious groups that also included al-Qaeda, Hamas and the Ku Klux Klan. And this is just the tip of the iceberg. Along with evangelical Christians, Tea Party activists, “conspiracy theorists”, anti-abortion protesters and those concerned about a “New World Order” have also been identified as dangerous extremists in a whole host of official U.S. government documents. For a large number of examples of this phenomenon, please see my previous article entitled “72 Types Of Americans That Are Considered “Potential Terrorists” In Official Government Documents“. And the frightening thing is that the federal government has actually been doing research into methods that change the way that people view the world. As I have written about previously, the government is actually developing technology that would enable it to brainwash people and change their religious beliefs. So who would the government do that to? They would do it to “extremists” and those that belong to “hate groups” of course. Once you are identified as a “terrorist”, then that gives authorities legal permission to treat you just like they would treat members of al-Qaeda. That is why it is so important for evangelical Christians to stand up and denounce this kind of vilification. In Nazi Germany, they didn’t just wake up one day and decide to start shipping Jews and other minorities off to prison camps. It all started with years of propaganda and demonization. And now a similar thing is happening in the United States. You would have to be completely blind not to see what is happening right in front of our eyes.